I’m so glad I got to shoot this adorable family this year. This mommy and I were pregnant with our little girls at the same time, while our boys were in the same classes at school. Such sweet family photos! Love all these blue colors together for beach photos! I think this little cutie liked her lollipop more than her cake, but regardless we caught some really cute pics of her celebrating with her sweets. 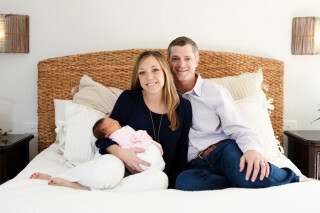 I loved spending the evening with this family for their photo shoot in Landfall. Landfall is one of my favorite locations to shoot at in Wilmington, NC. When you add in a cute little family, it makes for really fun pictures. This little girl has the best smile!